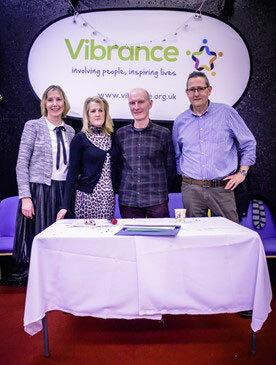 The annual Colin Richardson Awards, set up in 2009 to honour the Vibrance Chief Executive of 12 years who died of cancer in 2008, were recently awarded at the final celebrations of Vibrance 25th Anniversary. The awards were created to show appreciation for staff that have made an outstanding difference to the quality of life of a Vibrance service user. Nominations for the award are made by service users, service users families, peers and line managers. 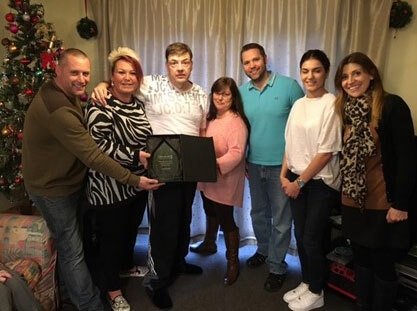 The 2015 Team Award went to Larwood Care Home, which offers round-the-clock care for people with learning disabilities, for the outstanding difference they have made to one of their residents following a change in his medication which has detrimental impact upon his behaviour. The Larwood team were chosen for the award because of the support they offered him during what proved to be a difficult time, they focussed on the service user as a person and not on his changing behaviour. Thanks to their intervention he was able to get through a difficult period of time and remain in the care home. The 2015 Individual Award went to Kimberley Adams, who is a member of the Outreach team. Kimberley’s continued support towards a resident and his family during his battle with cancer, which he sadly lost in 2015. Kimberley remained extremely committed and supportive, including attending hospital appointments. Kimberley has been a brilliant support to the family, in what has been a very difficult time.